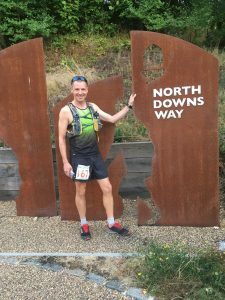 Huge congratulations to Neil Boosey for his outstanding achievement, completing the North Downs Way 100 (mile) race in an amazing 22 hours and 44 minutes! Thanks to Neil for this detailed account of his adventure with his crew! 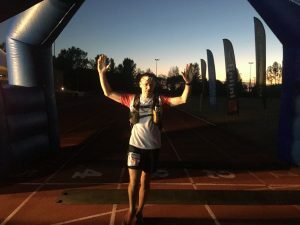 The Centurion North Downs Way 100, is a 102.9-mile trail run from Farnham, along the Surrey Hills to Ashford in Kent. August 4th, Ruth dropped me at St Polycarp’s school in Farnham at 4:30am for registration and kit check. There we bump into our very own Lee Kemp, Sarah and Darren Frost. At 05:30am we head down past the station to the start. Friends, Simon and Jamie arrive and we join the back of the pack for the race briefing. I remember ”..this is a long, hot day, save energy, there’s plenty of time to push on after dark…”. At 6am the hooter blares, 230 runners, pumped with nervous excitement, set off. I’m fighting to control the urge to rush off too fast. I concentrate on calming down and getting to my first goal, Denbies, feeling fresh. We chat as we jog along at about 12min/mile pace. The course winds its way through Puttenham Common, Compton then over the River Wey at Guildford and across Shalford Park. My nerves melt away as I see Kat Hobbs and James Williamson cheering us on. Up Church Hill towards St Martha’s I recognise Jesper Lindstrom bounding down Church Hill – brilliant! At Newlands corner I restock drinks bottles at the check point, then it’s through the woods of Ranmore Common. I take a moment to look south at the wonderful views of the Green Sands way and Leith Hill, clear and sunny. Meanwhile the temperature is already in the 20’s. At Denbies my son Ollie and girlfriend Holly “The Crew”, are waiting with gels / kitkats, flapjacks and drinks. 21 miles done and feeling really good. It’s an easy downhill to Dorking, where I bump into Kate Fargus out on a bike ride. High 5’s and off again. The short road section is exposed and really hot, I focus on keeping my pace steady and breathing calm. I buzz in and skip past the small crowd at the check point at Box Hill stepping stones. Across the stones up the steps. “No rush, don’t push” is my mantra as my heart rate picks up. A guy comes down the steps towards me, “forgot my hat” he laughs as he passes. Box Hill to Reigate is a great section, twisty/turning trails, very runnable, I pick up the pace and gain a few places. Reigate Hill is big, I start to fret that I’ve gone too fast since Box Hill as I’m feeling dehydrated, I can tell because I’m unable to eat. I force down all of my remaining drinks, almost bursting as I trudge up the hill. At Reigate Hill (30 miles) there is no sign of my crew. Time is slipping away as I hunt around the car park with a phone to my ear. I stock up at the checkpoint and make use of the bucket/ice water/sponge, then head off. I get through to Ollie who was stuck in traffic and we plan our next meeting point. On the trail down towards Merstham I pass Luke Latimer (Montane Spine finisher), looking in total control, jogging along with his Nordic poles. My competitive spirit kicks in, as I’m sure he is aiming for sub 24 hours. For the first time I speculate about whether I might be able to do that too. By Merstham it’s mid-day and I’m roasting. Apart from the banana I still can’t eat. I switch to SIS Rego, coke and crisps, delicious! On up Gangers Hill where an absolute super star is handing out ice lollies. Centurion events are organised almost entirely by volunteers who also participate in the events. So, they know when you may need ice / pasta / kick up the backside or a big hug! Onward and upwards over Botley Hill 45m. Then along to Knockholt Pound for the half way check point – 51 miles / 10 hours on the clock. The checkpoint at the village hall was full of runners sprawled across the floor and seats, shading from the sun. I wolf down a bowl of spag-bol, soak my hat in cold water then head out to meet the crew by the pub. Bottles restocked, I set off on the second half, buoyed by my steady progress so far. To finish in under 24 hours, ten hours is the magic time for half way. I settle in with a guy running his 75th Ultra marathon. He’s behind target and struggling, I try to encourage him to keep hydrated and get though the hottest part of the day. After a while I notice that he’s dropped behind and I push on. The field is spread out now, I rarely see any other runners. The next few hours are a blur, the open sections very hot and the wooded sections steep hills with steps. At Wrotham I see a flag outside the village hall turn into the front door expecting an aid station, to see…an antiques fair. Ok wrong flag. After Holly Hill (65m), another brutal set of steps, the route levels out, then meanders gently down through woodland. The sun was setting, the heat of the day had passed and light shone low through the trees. I could hear buzzards high above and grass hoppers started fiddling their tunes in the grass. Overwhelmed by endorphins, happy with my progress, I have a “THIS IS WHY I DO THIS!” moment. I meet the crew just before crossing the Medway Bridge. As darkness falls, I look back to see the lights of the bridge stretch across the valley. Then my world shrinks from wonderful views across miles of countryside, to a small tunnel of light from my head torch. Perspective changes, as every mile feels so much longer. The thought of a whole night ahead, traipsing alone along this path, is quite overwhelming. Then, on the way up Blue Bell hill, I notice couple of torches ahead, I catch up with the runners and we chat as we as we make our slow way along. Blue Bell Hill 78 miles – the end of the middle! The climb up to Blue Bell Hill took a lot out of me as I’d pushed to maintain pace with the others. At first, I don’t recognise Ollie when he appears in my torch light, then I stumble and struggle to balance. I’m dizzy and can see concern etched on Ollie’s face. A thought strikes me that I don’t want someone at the checkpoint to pull me out, so I laugh it off and concentrate on getting moving. With a fresh shirt and an ice latte, I push on. Our plan was to meet again at Hollingbourne, (10m) but that felt so far and I was so stressed, I asked if we could meet at Deitling, 6m away. So, I trudge down the hill towards the infamous Deitling steps, a series of five hills each with steps cut into the hillside. Trying to work out what was going wrong, to take control of the process. I guess it must be hydration, so I take an extra SiCapp each hour and try to drink (Tailwind or Rego) every 15 minutes. Meanwhile traipsing up and down hundreds of steps. By this stage my right quad is in agony, so I’m going left foot first, up one step at a time. On the way down, there is no pain free approach, so I entertain myself by shouting “Ouch!” at the top of my voice on every step. Of course, there is no one there to hear me. By Deitling I’m feeling back in control, hydration is better and my appetite is back. Progress is really slow, but it’s progress. In a field before Hollingbourne, lit up, white as ghost in my torch light, the biggest bull I’ve ever seen, sitting across the path. I take a very wide berth, tiptoeing around the bull. Luckily, it’s only interested in it’s mouthful of grass. Three hours after leaving Blue Bell Hill, having covered just 10 miles, I arrive in Hollingbourne (88m) and get a wonderful surprise. Ruth, who had dropped me at Farnham, yesterday. Spent the day with her girls, before driving 100 miles to Ashford, to run the final leg with me. I’m delighted and quite overwhelmed. After a hug and a restock we’re off. We (well Ruth) sing ’80s kids TV songs and play eye spy. I could hardly string words together. Meanwhile Ruth patiently answers my questions – How many miles to go? What’s our ETA? Sorry how many miles? What time is it? At one point I trip, bust my big toenail and almost face plant on the road. The pain was exquisite and my poor toe throbbed from then on (for a week). Slowly we tick down the miles, Lenham (91m), Dunn street (98.4), St Mary’s Church at Eastwell (100m). Then we leave the North Downs way to cover the last couple of miles to the Julie Rose Stadium. Light appears on the horizon and birds start chirping as we head into Ashford. The route goes around the stadium via the car park. Elated, I tap on the car window and wake up poor Ollie and Holly, keen for them to see me finish. I notice the clock at the stadium, 4:40 am. And for the first time, my confused mind believes that sub 24 hours is actually in the bag. Then comes the slow crawl around a lap of the running track, before stumbling over the timing mat. Finish time 22 hours 44 minutes. I have no idea how I, correction, how we managed it. Without Ruth, Ollie and Holly I wouldn’t have. I get my T-Shirt and “NDW100 in 1-day buckle”. Then, at long last, I sit down. For the first time in 24 hours I force my eyes to close. My brain does not believe that I’ve stopped, I picture the foot path in my mind and I’m braced, expecting to trip and fall over. After a minute I relax as exhaustion consumes me. Posted in Runners Blogs, Uncategorized.